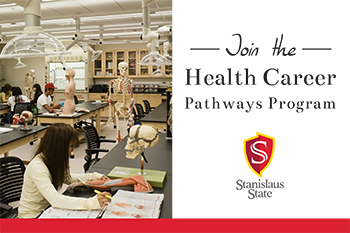 Welcome to the College of Science (COS) at California State University Stanislaus. We are one of the newest and most dynamic colleges on campus, where the faculty and staff are dedicated to student success. The College of Science is an intellectual community dedicated to providing students and faculty the scientific, mathematical and technological capacity to contribute to their disciplines and succeed in their academic pursuits. The dedicated faculty and staff seek to educate students through quality instruction, experiential learning, research experience, community engagement, and effective advising. The College of Science departments form a scientific community dedicated to providing students the intellectual and technological capacity to contribute to and succeed in their academic and scientific pursuits.